General Admission tickets are always available at the event gate! For your convenience, they’re also available online in advance. You’ll get an email confirmation and can print or download your tickets to your phone. Saturday is the only one-day ticket available, as Saturday is the featured event of the weekend, Round 7 of the Lucas Oil Motocross Championship! Tickets are priced by day of arrival. You pay ONE time, on the first day you arrive. Gate hours: 6pm – midnight. Admission price is $95 for ages 12 & up; $45 for ages 6-11. There are no Wednesday-only tickets available. If you’re coming in to claim a camp site and drop off a trailer, you’ll have to buy a Wednesday wristband. Gate hours: 6am – midnight. Admission price is $85 for ages 12 & up; $40 for ages 6-11. There are no Thursday-only tickets available. Admission price is $75 for ages 12 & up; $35 for ages 6-11. You’ll receive a wristband that’s good through Sunday. There are no Friday-only tickets available. The following items are upgrades to a General Admission ticket. These are optional and are not required to watch any of the races. You must purchase a General Admission ticket in order to use any of the add-on items! 1. A Racer X All-Day Pit Pass is good from 8:30am until 6pm and includes a one-year subscription to the magazine. Limited quantities available. Print your ticket, walk through Gate 4 and bring your ticket to the Racer X booth to get your pit pass. Also available at the event at the Racer X display booth. RACER X PIT PASSES WILL BE AVAILABLE ONLINE SOON! 2. An Early Entry Pit Pass is $15 and is good from 9am until noon Saturday. Limited quantities available; purchase now online or at the track. Print advance ticket and bring it to, or purchase one at the night track vending area Friday from 7pm – 9pm, or Saturday morning near the Gate 9 entrance to the pro pits starting at 7am. There are three separate VIP areas and passes to choose from. Please note that a VIP pass is an optional add-on to a General Admission ticket and does not include admission to the event. A favorite choice of returning guests, the VIP North area is located in the middle of all the action. It’s a short walk to the pro pits, the midway and vending areas, or the spectator infield. You’ll notice some upgrades to the VIP North area this year, including the addition of a cash bar exclusively for VIP North guests, bigger TVs and a few other surprises. Guests have an exclusive view of riders coming directly toward the VIP North tent as they come through the sand whoops section. They’ll jump over the T3 tabletop out of sight, and spectacularly come back into view as they launch over LaRocco’s Leap and head toward the finish line. When riders are out of sight, you can follow the racing on large TVs in the VIP tent, along with live timing & scoring. 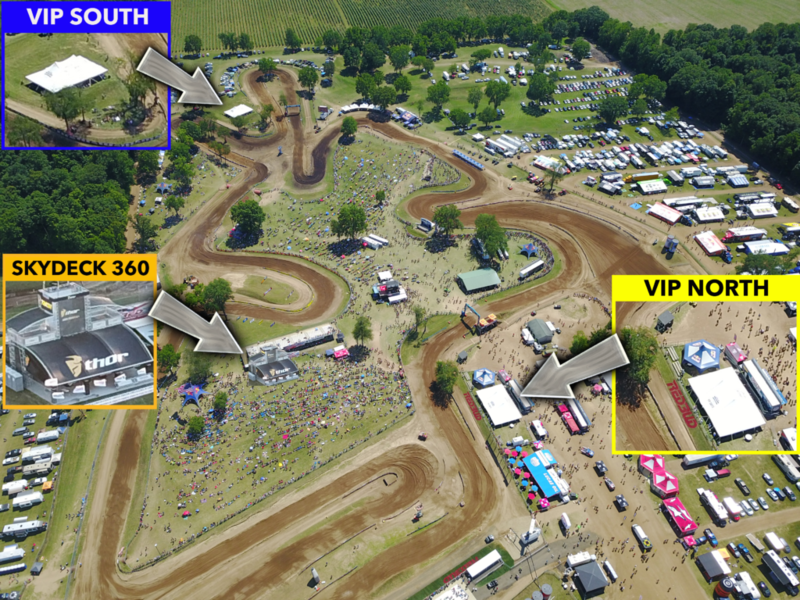 The best parking choice for VIP North is accessible from Gate C on Red Bud Trail. VIP Parking is outside the main track entrance near Gate 4. Adult (age 12 & up) VIP North passes are $175; Child (age 6-11) passes are $80. The quiet choice, and a favorite of our staff and management. The VIP South tent is outside the high traffic areas, on a hillside overlooking the south side of the racetrack and spectator infield. Riders come into view as they come over the Ski jump and disappear as they take off from the Launchpad jump. Riders navigate the off-camber turn directly in front of the VIP South viewing area. When riders are out of sight, you can follow the racing on large TVs in the VIP tent, along with live timing & scoring. Parking for VIP South guests is very conveniently located near the tent, and can only be accessed from the Gate C entrance on RedBud Trail. Use the farthest left (south) gate lane for parking access. Show your parking tag to parking staff as you’ll be among the very few cars heading straight after the gate lanes instead of turning right. Adult (age 12 & up) VIP South passes are $175; Child (age 6-11) passes are $80. This is an exciting new option for 2019, with very limited quantities available. The structure features a ground level covered area where lunch will be served, and two upper level platforms with fantastic views of both the north and south sides of the race track. A cash bar will be available for Skydeck 360 guests as well. We’re waiting on a few details regarding series sponsors and guests, and will have the pricing and options finalized just as soon as possible. If you’re interested in this pass, shoot us an email with the subject, “Skydeck 360 notifications”, and we’ll email you advance notice before the tickets go on sale. Reserved seating is available in the large set of grandstands along the Monza Wall, in the center of the track infield. Your grandstand seat is reserved all day. Check out vendors and displays, the pro pits, other sections of the track and your seat will be waiting when you return. Top row (Row 15) seats sell out well in advance. It’s no wonder! They’re the absolute best seat in the house; price is $50. Only people who purchase Row 15 seats can purchase Row 14. Seats in the remaining rows (2-13) are $5 each for ages 6 & up; no charge for 5 & under. All seats are available now online. Remaining seats can be purchased at the entrance to the grandstands on Saturday morning, starting at 7am. FRONT (BOTTOM) ROW: RESERVED FOR WHEELCHAIR AND HANDICAP ACCESS (no charge for fan plus one guest). If Row 1 seats are open, you may also use those. Call our office for a code to reserved Row 1 and 2 seats.